2017 was an exciting year for Advanced Custom Fields, as we continued our quest of making both our free and PRO plugins better than ever. Some changes were quite noticeable, like the new fields and UI improvements introduced in ACF PRO throughout the year. Other changes were a bit more behind-the-scenes, but showed up in terms of improved performance and bug fixes. When it comes to ACF PRO, version 5.6 (released on July 25) brought major improvements to UI and UX. Whether it’s the reassurance of the confirmation tooltips included with the Repeater and Flexible Content fields, or the incredible power of adding custom fields to menus and menu items – ACF Pro has evolved by leaps and bounds. The free version of ACF also saw some love 💖, as it continues its march towards version 5. Early adopters can opt-in to the update right now. Looking back at 2017, what was your main focus in terms of ACF’s development? Elliot Condon: Looking back, I’d like to think that 2017 was an important year for ACF. We hit a lot of milestones and finished the year with a clear vision for the future. Our initial focus was to release Version 5.0 of the free ACF plugin – and we nearly did it. But I’m glad we got distracted working on new features for ACF PRO! We decided early on that there was no need to rush the Version 5.0 release and opted for a year-long plan to better allocate time to the 800,000+ active ACF PRO installations! If you weren’t already aware, ACF PRO is up to version 5.6, yet the free version is still on v4.4. We released updates to our premium Add-ons (version 2.0) that added support for ACF v5. And we also built in an Early Access feature to the free plugin – allowing users to update sooner than later. Were there any “under-the-radar” items from the year that you’re especially proud of? Elliot: For sure. We actually had some major server issues during the first quarter of the year due to outdated hosting and a growing customer base. If you were developing with ACF at the time, you might have noticed the downtime when accessing our docs, or even when downloading plugin updates. After wasting months with the previous host’s support team, we bit the bullet and moved over to SiteGround – and I’m so glad we did. SiteGround did a lot of the heavy lifting for us during the move, helped us optimise our sites and have continued to provide a rock solid server that handles a huge amount of traffic! As we move into 2018, what are your top goals for ACF? Elliot: ACF is moving into 2018 with a focus on both performance and standardisation. To start with, we are rebuilding our JS library from the ground up to adopt modern practices and provide a strong framework for the coming years of development. This will also play a part in the upcoming release of WordPress 5.0 and the introduction of Gutenberg. The arrival of Gutenberg will most likely be the primary focus for all plugin and theme developers throughout 2018. 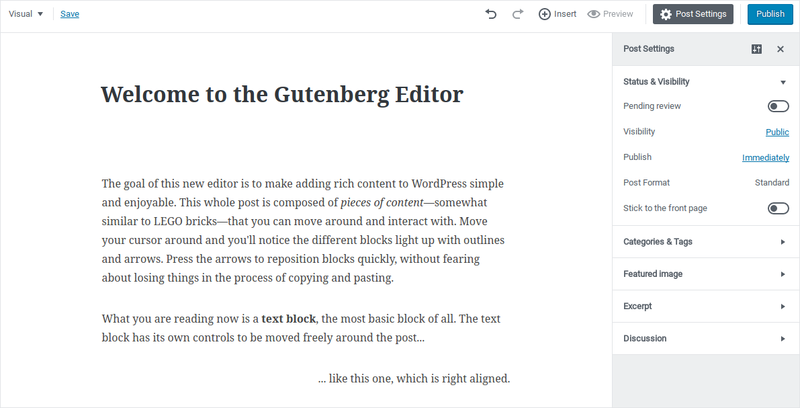 For us, Gutenberg means a new UI for editing posts. This will affect everything from PHP actions, filters to jQuery event listeners. Our goal is to add in the required compatibility so that ACF continues to work as per usual in this new edit screen. After the dust settles, we will be back to adding new ways to customise and improve all aspects of the plugin. One feature that I am looking forward to most is an extendable API for conditional logic rules. This will allow us to provide heaps of new conditional logic rules out-of-the-box, but also allow you to create your own! Lastly, we will be releasing the long-awaited ACF version 5 (free) update. If you work with ACF PRO, this will have no effect on your projects as it’s already up to version 5.6. But for those who are using the free plugin from wordpress.org, version 5 will introduce some major updates and improvements! If you are interested in upgrading to ACF5 right now, check out our early access blog post here. WordPress 5.0 is slated to come out sometime in the new year and will feature the new Gutenberg editor. It’s quite a different experience than we’re used to seeing. How does ACF fit into this new way of creating and editing content? Elliot: At this stage, I don’t see Gutenberg introducing any change to the ACF workflow. The ACF plugin has always respected the WP admin edit pages and worked alongside them. In theory, the only changes should be to the UI and UX. It’s important to note that ACF is neither a replacement for or competition against page builders. In fact, having both side by side is really the best option for content editing! We will find a place in the new edit screen for our custom fields, be it via registered blocks or custom HTML. Whenever a big change comes to a widely-used CMS like WordPress – people get a bit nervous about things potentially breaking. Should there be any concerns with regards to Gutenberg / ACF compatibility? Elliot: Yes, we should be concerned. This is the biggest change we have seen in years and it will affect every website that updates to WordPress 5.0. The new Gutenberg edit screen does not only change the way we edit the “post content”, it also changes the markup and elements on the edit screen. This is the change that makes me nervous for the WordPress community because so many of our content tools (plugins, themes, custom functionality) rely on these elements to exist. I am confident that we will add compatibility for Gutenberg before it ships, but I’m not confident that every client is aware of the change. Beyond Gutenberg, what else should we look for in 2018? Elliot: In line with Gutenberg’s vision, we should be looking forward to a more integrated editing experience. New plugins will emerge and existing plugins will become smarter. I’m hoping to see more compatibility between plugins as we work together in adding support for the new edit screen. I’m also excited to announce our focus on adding useful and compelling content to our Blog – making it a must-read for both developers and users. We really want it to become a showcase for learning more about ACF’s capabilities. In all, 2017 brought positive change to ACF and ACF PRO. That sets us up for an incredibly exciting 2018. With major changes expected in WordPress 5.0, developers will have a lot to wrap their heads around in preparation for the Gutenberg editor. ACF hopes to help make the transition for our users as smooth as possible. There may be bumps in the road – but we’ll get there together. Whoa! ACF made it to the semi-finals 🔥🔥🔥!